Little did American newspaper editor Horace Greeley know when he penned the famous quote “Go West, young man” that it would also be the rallying cry for a Metro Phoenix regional corridor ready to witness incredible growth. For years, the Loop 303 freeway was a dream of the West Valley. Its opening in October 2017 has already started to change the development patterns in its wake. Even before that, most thought the South Mountain Loop 202 would never come to fruition. Today, construction is well under way with a late 2019 anticipated opening. These much-anticipated transportation corridors connecting the West Valley to the Southeast Valley are quickly becoming a reality. Panelists at the July Friday Morning Breakfast shared their views of the West Valley’s future with a full house at Phoenix Country Club. Moderating the event was Greg Vogel, Founder/CEO, Land Advisors. 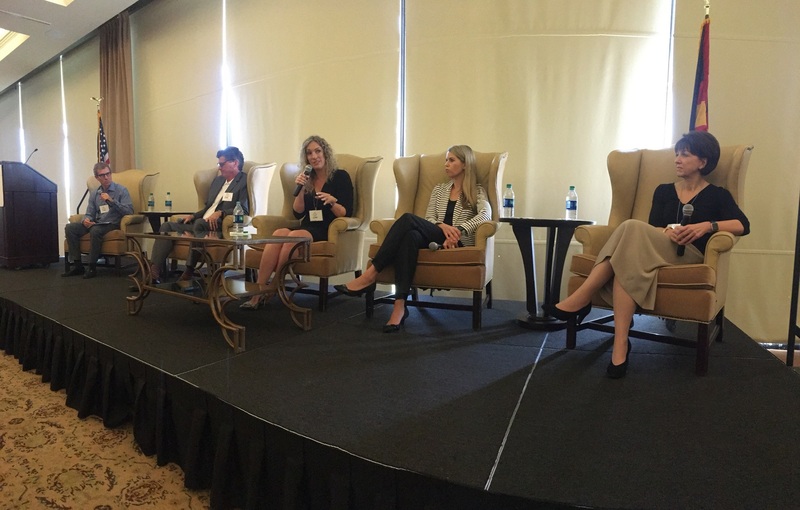 The panel comprised Lori Collins, Deputy Director, City of Phoenix; Megan Creecy-Herman, Vice President, Liberty Property Trust; Tony Lydon, Managing Director, JLL; and Cathy Thuringer, Principal, Trammell Crow Company. “I started some 31 years ago in the far West Valley and worked my way in because that’s when Interstate 10 was being completed from Los Angeles,” Vogel said. “Also, 1985 was when the first half cent sales tax was passed. It enabled us to get ahead in transportation. “The tables shifted to the East where there was more clout, money, and strong lobbying efforts. The 202 and 303 got shorted. But you can’t build freeways anywhere now. The West Valley is open,” Vogel said. The Valley’s population growth has been the key to its development growth, Vogel said. In 1985, there were 1.5 million people living here. Today, the Metro Phoenix population is just shy of 5 million at 4.9 million. The Valley’s growth, Vogel said, has now shifted to the West Valley. Lydon said a “silver bullet” in the West Valley’s toolbox is its Foreign Trade Zone (FTZ) designation. Other factors bolstering the West Valley’s standing, he said, include infrastructure, and capital investment in infrastructure. Thuringer said Phoenix industrial space is highly sought after with a lot of large capital players in the gateway markets. “It’s a better investment,” she said. The West Valley is key when competing against other regions, Collins said. “Roughly 85 percent are looking for ready space,” she said. New product or ready space? Obsolescence is a hot topic, one that bodes well for the West Valley, Lydon said. When it comes to significant anchors in the West Valley, panelists pointed to the region’s higher education entities, Grand Canyon University and Midwestern University. Lydon said a German pharmaceutical firm toured the Southeast Valley and Sky Harbor submarkets but decided on the West Valley. What will benefit from growth in the West Valley? Lydon’s list includes e-commerce, food and beverage, manufacturing, healthcare, logistics, data centers, education, workforce, infrastructure, the FTZ, and executive housing. Sunshine Acres Children’s Home in Mesa was announced as the recipient of the 2018 Community Project. Partners transformed an underutilized parcel of land into a vibrant fitness park and recreation area in 2016. Valley Partnership is returning to Mesa on Nov. 3. Please join us.